We are happy to have launched custom date entry on our charts. Try clicking the mouse over the date range in the top right corner and enter the exact date range for which you want the chart to be set. Want to see the chart for all of 2007? 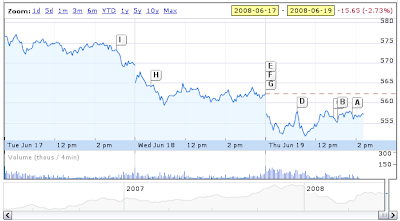 Enter '2007' as start date, and '2008' as your end date, and the chart will reset to display the stock price for all trading dates of 2007.Want to see the chart for February of 2008? Enter '2008-02' for start date and '2008-03' for end date. If you encounter problems or have suggestions, please let us know.